In an effort to stave off the challenge from mainstream publishers in a rapidly changing market, two of the world’s smallest book publishers, Publishing Genius and Narrow House, are engaged in talks to combine their businesses. 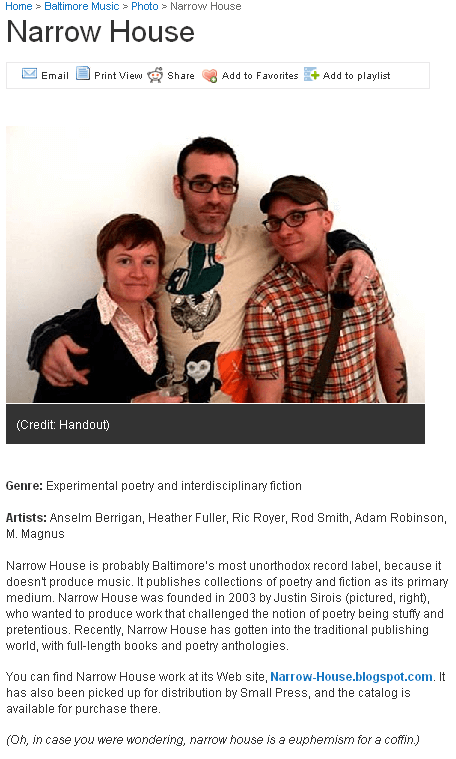 Justin Sirois, the Baltimorean founder of the group that owns Narrow House, said Friday that he was discussing a potential deal with Publishing Genius’s owner, Adam Robinson, also of Baltimore. The merger, if completed, would create a combined entity that would control nearly none of the United States book market and feature an extraordinary roster of authors and poets like Chris Mason, Anselm Berrigan and Ric Royer of Narrow House and Melissa Broder and Stephanie Barber of PGP. The potential consolidation comes as innovative publishers try to compete with, well, no one—but lower prices on things like self-publishing have put pressure on small presses to adjust their strategies at a time when they can’t really get their books into brick-and-mortar stores effectively anyway. A deal could signal a move toward further consolidation among the smaller publishers, but probably not. A merger of Publishing Genius and Narrow House could help the publishing houses cut costs by combining resources, but it probably won’t give them more heft in negotiations with anyone, as readers increasingly abandon print for cheaper e-books. “A combined Publishing Genius and Narrow House would be a supplier so small it would be very unlikely anyone would want to dictate terms to them,” said a fake expert, contacted for this article. Another fake media analyst said early panic is not justified. “No one should care because there are already tons of small presses not really doing anything meaningful anyway,” she would have said. A deal between the presses would not be subject to government approval. Although financial details remain preliminary, Publishing Genius is expected have an ownership stake of, like, all of Narrow House, according to a person briefed on the talks. This article was poached from this NYTimes story, from October 25, 2012.